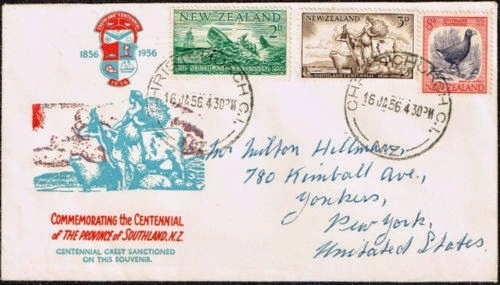 With the town of Invercargill being surveyed and laid out in 1856 it was agreed that Southland's Centennial was to be celebrated in January 1956, although smaller settlements at Riverton, Bluff and on Stewart Island existed before that year. 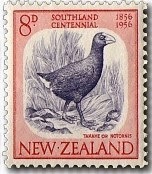 Three stamps were issued to commemorate the event, depicting whaling, and farming scenes plus the rare bird - the takahe. 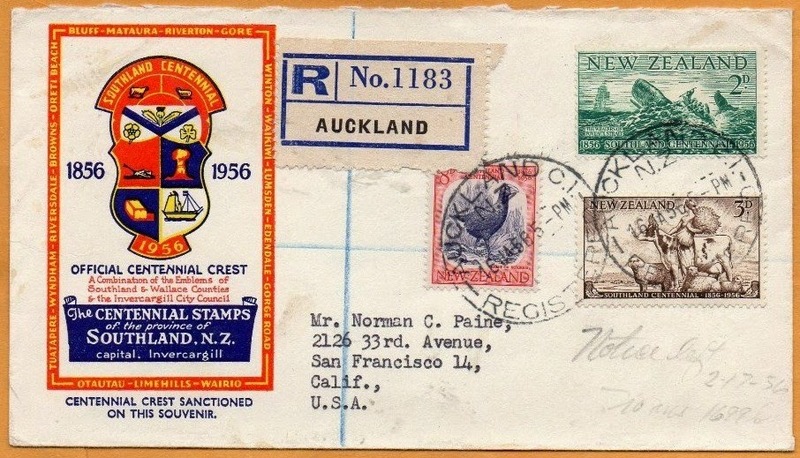 A competition was held to select the stamp designs, with the end result being that the 2d design was completed by E R Leeming, the 3d by L C Mitchell and the 8d by M R Smith. In selecting the designs via a contest I believe the opportunity was lost to create a issue of similar designs. To me the 8d always stands out as being different to the other two values. 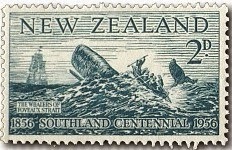 Whalers were depicted on this stamp due to their direct link to one of the earliest phases of European settlement in New Zealand. They came first as fleeting visitors hunting the sperm whale in the open sea. Later, shore whaling stations were set up - the first one in 1827 at Tory Channel, at the north of the South island. Other stations appeared around New Zealand over the next ten years. But the industry did not last very long and by 1860 whales were becoming scarce. As a result many whalers turned to other work. Southland is a farming province. 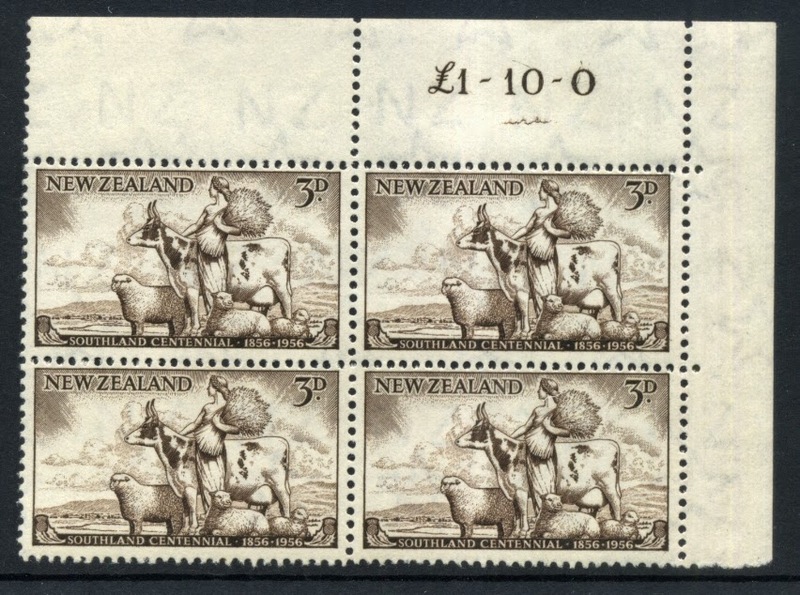 That is the reason for the agricultural and pastoral scene being picked for this stamp. One quarter of the South Island's sheep are in Southland, and it is the sixth most important sheep farming district in New Zealand. The district also contains the fourth largest number of beef cattle farms in New Zealand. On the plains of Southland many herds are also run for dairy factory supply. Arable mixed farming is also a feature of the region. This bird was thought to be extinct, as it had not been seen since 1898. It was re-discovered in 1948 in Southland's Fiordland by Dr G Orbell of Invercargill whose interest in the bird began in the 1920s - after he spent nearly thirty years picking up information about possible hiding places. Fully grown the takahe stands over 50cm high and weighs about 2.7kg. The wings, incapable of flight, have up to a three foot span. The adult bird is vividly coloured. decided to continue printing. Any bigger and no doubt the plate would need replacing. A Small Collection of Special Covers. The first cover in this small collection is a home made First Day Cover. What I like about this one is the very clear post cancels. The date can clearly been seen so there can be no doubt this letter was posted on the First Day of Issue. I can imagine the post master in Invercargill carefully applying the stamp to get these clear, sharp strikes. A letter from Auckland to the USA. Again the date proves it as being a First Day Cover although the strike is a bit blurred. What is of interest on this cover is a panel on the left with the gold border. Inside this is the official Centennial Crest of the Southland Centennial. Again we see the Official Crest on a registered letter to the USA. The name 'Ahuriri' is the city more commonly known as Napier. The cover above shows the Official Crest but in this case its part of the design used for the 3d value. 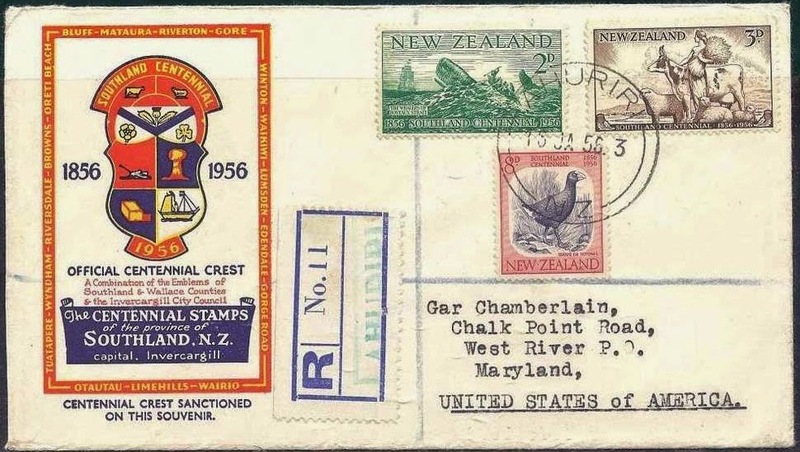 Although the posts marks are rather poor it can still be made out that the cover was posted from Christchurch on the 16th of January, 1956. I think this might be a First Day Cover. The post marks are not clear so its hard to be sure. Now look the bottom left stamp of the block of 3d stamps. You can make out part of the cancel. Is that a 16 followed by the letter 'J'? 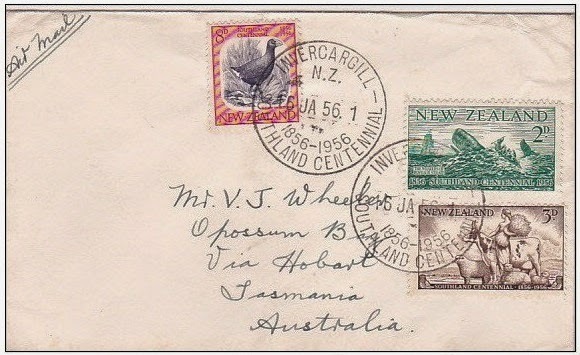 (See the enlargement below) If so then this cover was posted on the 16th of January, 1956.